WARP Members Enjoying IFAM, Sara is a Hoot! The Internet access in Independencia has dwindled to just email text, so it is back to blog postings once a month from Internet cafes in Cochabamba. A lot has happened since the last posting written from the U.S. in June! 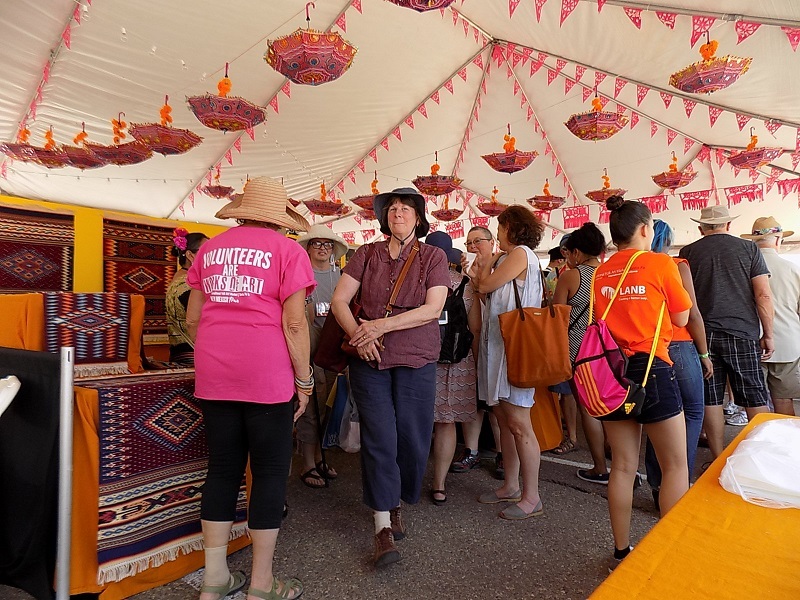 The 2016 WARP annual conference was held in Santa Fe, NM to coincide with the 13th annual International Folk Art Market (IFAM). Thank you, WARP! 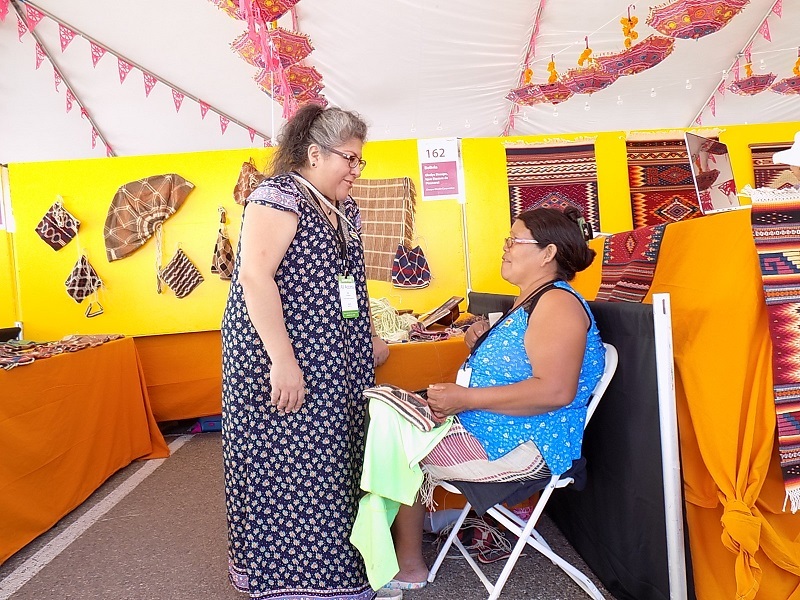 The thought of applying for a vendor booth would have remained just a thought if PAZA hadn’t had an opportunity to visit and evaluate IFAM as a possible sales venue for the Bolivian weavings. Dorinda volunteered 2 shifts at the booth of the only Bolivian artisans out of the 165 vendors. Bolivia is a small landlocked country, but it is a jewel due to the diversity, be it biological or ethnic and cultural. 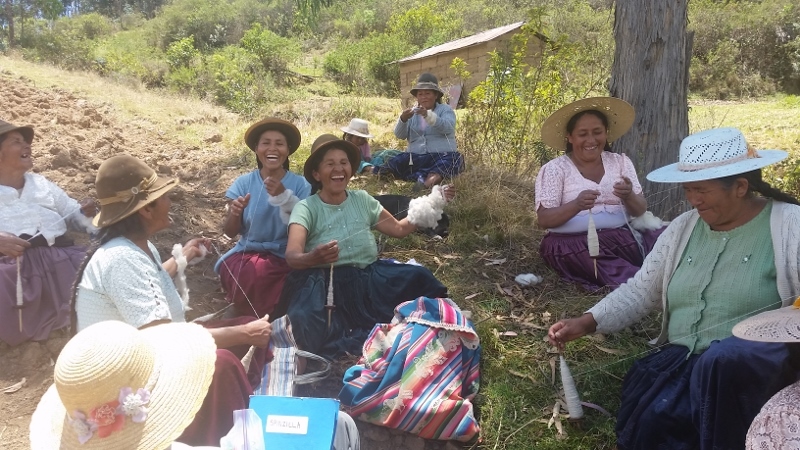 Doña Ique Etacore represented the Cheque Oitedie Cooperative, a group of women who weave bags with plant fiber. She is an Ayoreo woman from what was once the heavily forested area of Santa Cruz which is a world away from Andean Bolivia. She was accompanied by Ing. Ines Hinojasa, an ethnobotanist from La Paz. This was their 6th IFAM year. Ing. Ines was outgoing, spoke excellent English, and remembered shoppers who had bought bags in past years. 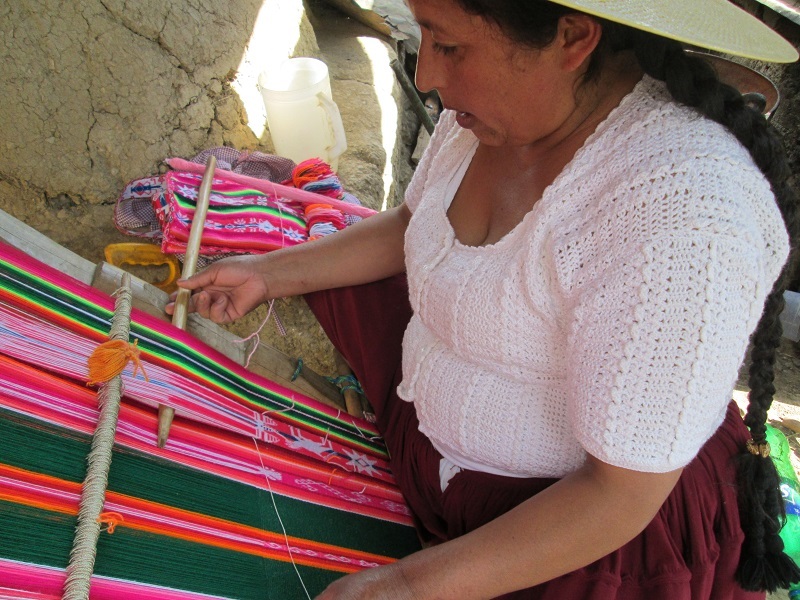 Doña Ique sat weaving with a needle or “spinning” the plant fiber by rolling it along her leg using a touch of ash to soften it, shyly responding when addressed. She and Ines made an excellent team. 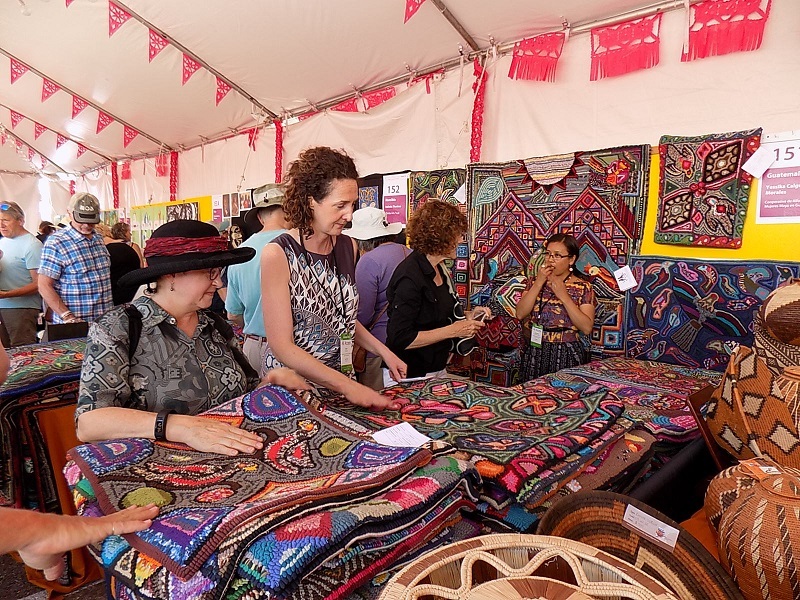 One of the most eye catching booths was the hooked rugs made by Guatemalan artists using traditional motifs. The beginning of their fascinating success story goes to WARP member, Mary Anne Wise of Cultural Cloth. The 2 days at IFAM did alleviate some concerns about applying, but the big question of what type of weavings to submit with the application was not answered. 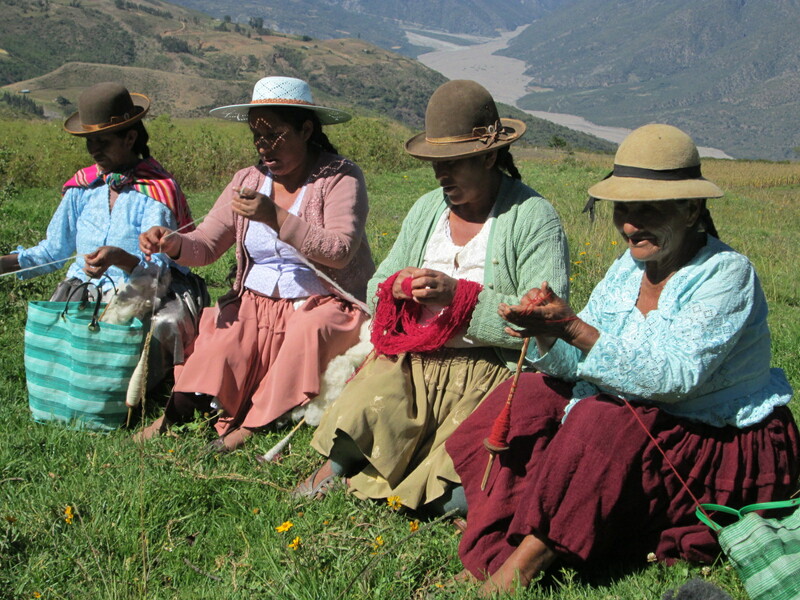 The folksy welcoming ambience of IFAM would help with the cultural shock of Doña Maxima and another weaver´s first visit to the U.S. Two weavers would have to make the trip together as a Quechua support system for each other. Through years of sales experiences PAZA has learned that the traditional products such as the ch´uspas (shoulder bags), fajas (belts), and tapa bancas (runners), don´t have a national or foreign market. 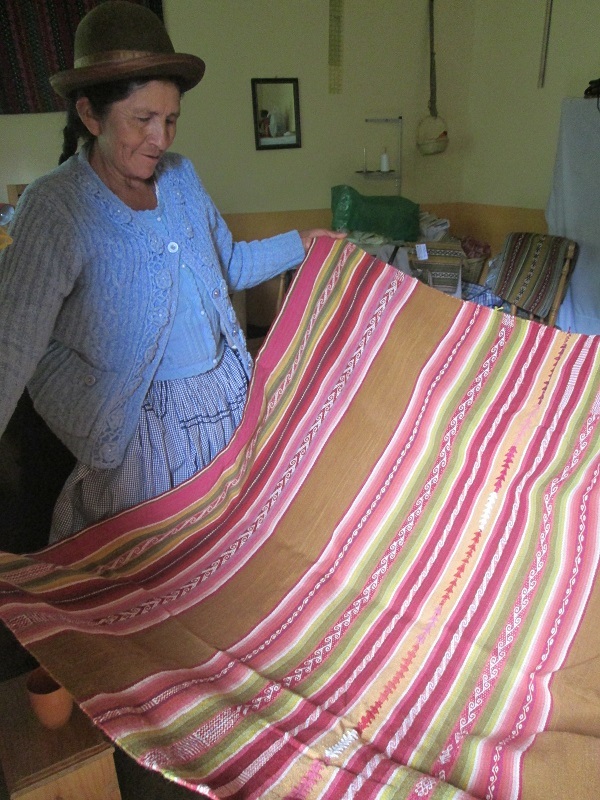 Although the techniques for making the weavings for the yoga mat straps and zippered pouches are ancient, the end product is not traditional. So, the products that have a market aren´t appropriate for IFAM. technique, but would the aguayos have a market? Should they be woven with synthetic yarn instead of the natural dyed wool used in all weavings currently sold through PAZA? The synthetic yarn wouldn´t be attractive to moths. Weaving production would have to begin a year before the application acceptance would be received. How could PAZA afford to prepay for weavings, especially considering that they haven’t found a market outside of an event like IFAM?